These White Chocolate Dipped Gingersnap Cookies are soft and chewy on the inside, while crisp on the outside. Filled with cozy spices and topped with creamy white chocolate, these cookies will be the hit of the holiday dessert table! We’re less than a week away from the festivities, can you believe it? Whether you have some last minute shopping, baking, or gift-wrapping to do, I hope you’re enjoy all that the season has to offer. I feel like I often float through the holidays on autopilot, checking things off my list and looking forward to relaxing with family and friends. But, this year, I’ve tried to stop and really take in the moments. Sitting by the fireplace and sipping on hot chocolate, gazing at my Christmas tree, watching those cheesy, made-for-TV holiday movies, and driving around to look at Christmas lights. Those are just a few of the little things that make me happy come the holidays. And you know what else makes me happy? Cookies! Well, that, and anything having to do with the classic holiday flavors of peppermint, eggnog, and gingerbread. Since it’s been way too long since I’ve shared a cookie recipe with you, I thought I’d make up for it by featuring these White Chocolate Dipped Gingersnap Cookies. Gingersnaps remind me of the gingerbread cookies that my Grandma used to make growing up. They were (and still are) a tradition in my family, and I look forward to them every year. And while I don’t want to recreate those cookies, I decided to come up with my own gingersnap version. 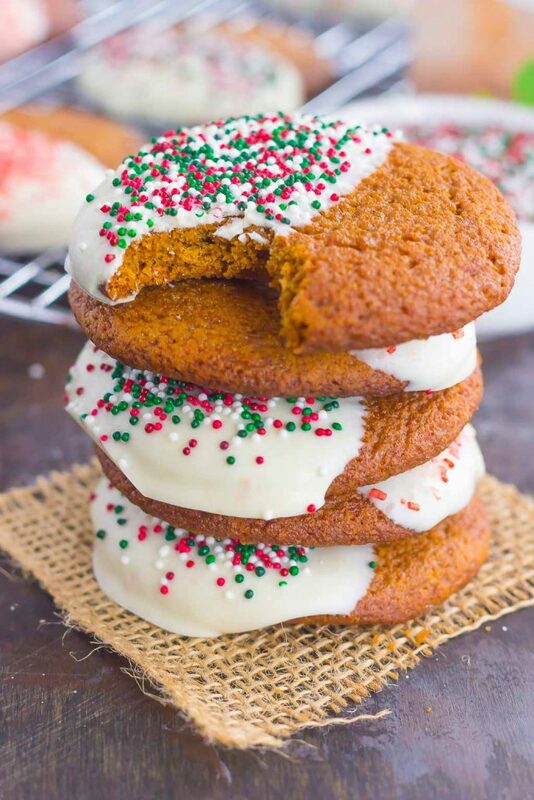 If you’re a fan of soft and chewy cookies, then these gingersnaps were made for you. Packed with spices and molasses, these White Chocolate Dipped Gingersnap Cookies feature the perfect amount of flavor. I got the idea for this from from All Recipes but put my own unique spin on this treat. If you’ve been hanging around here long enough, you may remember this Pumpkin Pie Baked Oatmeal or these Pumpkin French Toast Cups, both made with SPLENDA® Naturals Stevia Sweetener. It’s a great tasting, no-calorie sweetener made with stevia extract. The SPLENDA® Brand means no added colors or flavors, no preservatives, and only non-GMO ingredients. And that’s what gives SPLENDA® Naturals Stevia Sweetener its great taste. And that’s why it’s my favorite sweetener for baked goods. Like most of my recipes, these White Chocolate Dipped Gingersnap Cookies are easy to make (and even better to eat). The dough does need to be chilled for just a short amount of time to ensure that the cookies aren’t too flat and messy. And the white chocolate. Let’s not forget about that! It’s what makes these gingersnaps extra special. The smooth and creamy white chocolate gives these cookies a hint of sweetness, and a pretty pop of color, too! So, if you’re looking for the perfect cookie to add to your dessert table, or are just in need of a sweet treat, these White Chocolate Dipped Gingersnap Cookies will hit the spot. Grab that SPLENDA® Naturals Stevia Sweetener and whip up these delicious cookies today! In a medium bowl, whisk the flour, ginger, cinnamon, baking soda, and salt. Set aside. 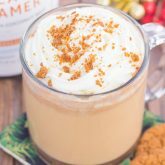 In a large bowl, cream the butter, brown sugar, and SPLENDA® Naturals Stevia Sweetener until light and fluffy with an electric hand mixer or stand mixer with fitted paddle attachment. Beat in egg, then stir in water, vanilla, and molasses. Refrigerate dough for 45 minutes to 1 hour, or until easy to handle. 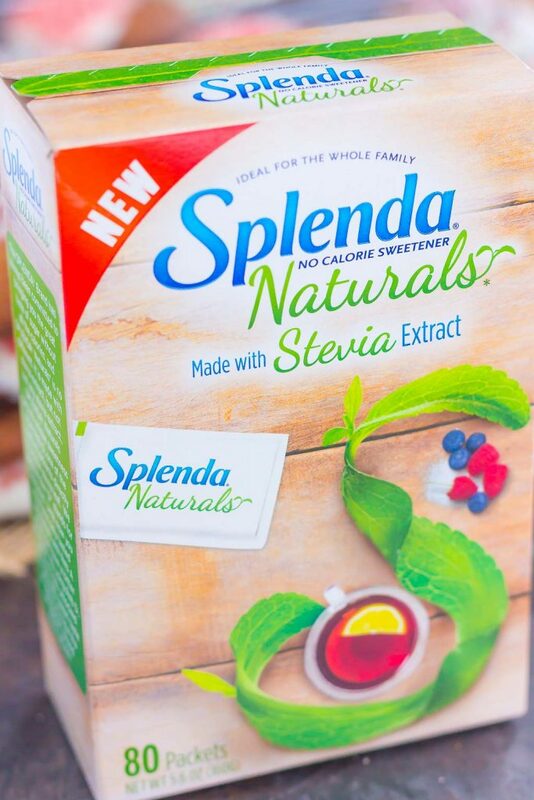 In a small bowl, add 3 tablespoons SPLENDA® Naturals Stevia Sweetener. Shape dough into small balls and roll in SPLENDA® Naturals Stevia Sweetener. Place 2 inches apart on an ungreased baking pan.Lightly flatted using the bottom of a glass or spoon. Bake for 8-10 minutes, or until edges are set, being careful not to overbake. Remove from oven and let cool for 5 minutes, then remove to a wire rack to cool completely. Once cookies are completely cooled, add white chocolate to a small bowl. Microwave on medium power for about 2 minutes to melt, stirring every 15 seconds so it doesn't burn. Working one cookie at a time, dip halfway into white chocolate and then place onto parchment paper to set. Sprinkle tops of white chocolate with holiday sprinkles. I can't believe that we are less than a week away from Christmas day! I've been saying the time is going so fast for a while now, but for some reason this year it seems like it went extra fast. It seems like the past few weeks I've been going non stop trying to get ready. I'm really looking forward to it, though, and can't wait :) !! It's so nice that your trying to enjoy the moments and take in everything. Sometimes we're all so focused on the the end result of things that we miss everything along the way. I'm certainly known for that and it's almost like you have to make a conscious decision to take a breath and just focus on what's in front of you, right? 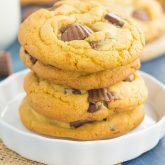 Speaking of in front of me, I love soft and chewy cookies and these look perfect. I wish they were in front of me now, lol :D I love the twist with the white chocolate and the sprinkles add a cute, festive touch. Pinned, of course! Have a great week, my friend :) ! This time of the year definitely goes by way too fast...I wish there was a pause button in life! :) Thanks for the cookie love, friend! The white chocolate makes these extra delicious. I hope you have a wonderful holiday, Dawn! Gayle, these White Chocolate Dipped Gingersnap Cookies look amazing!!! 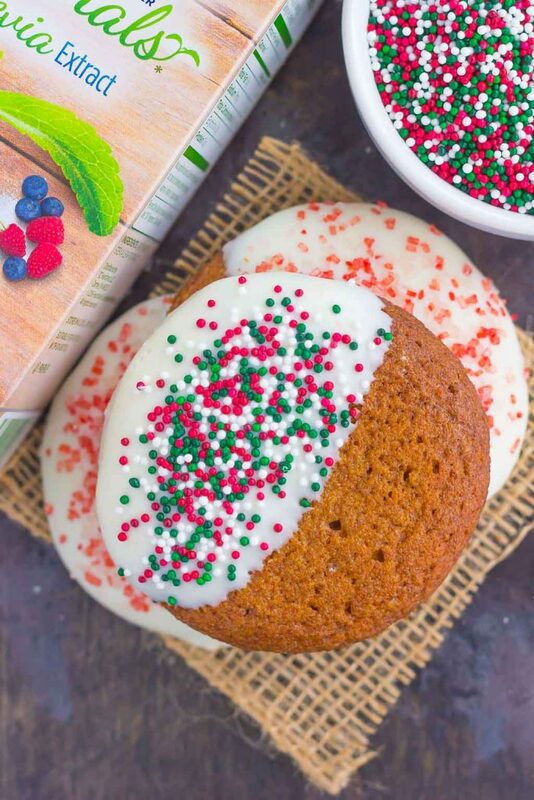 I'm all about the holiday sprinkles right now! These are perfection!! Hope you and your family have a very happy holiday!!! Thank you, Alice! I love the festive touch that the sprinkles give. I hope you have a wonderful holiday too, friend! What gorgeous cookies! I try dipping cookies and they never turn out as pretty as other ones I see on blogs. And it's so nice for your to hare this memory with your grandmother! Thanks for the kind words, Shelby! Baking ALL the cookies totally counts! :) And isn't white chocolate the best? It makes cookies (and just about everything else) a little bit better. Thanks for the kind words and pin, friend! Cookies always make me happy too, Gayle! 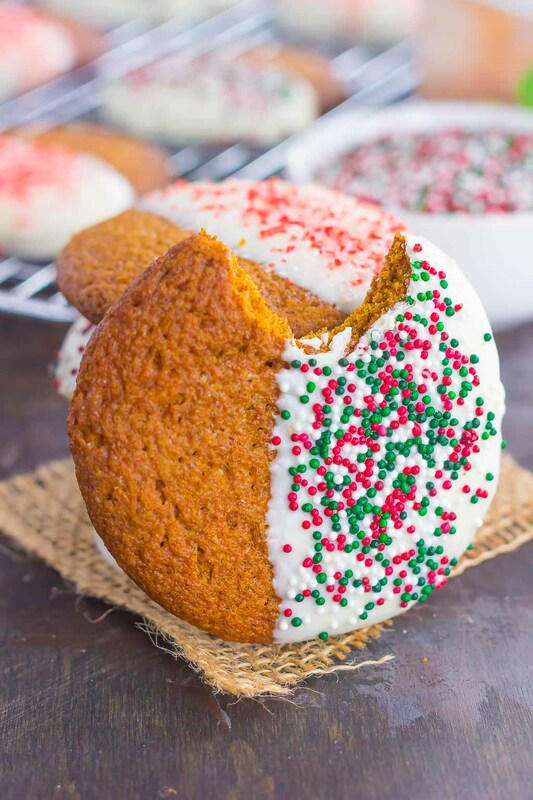 These cookies are perfect for the holidays. 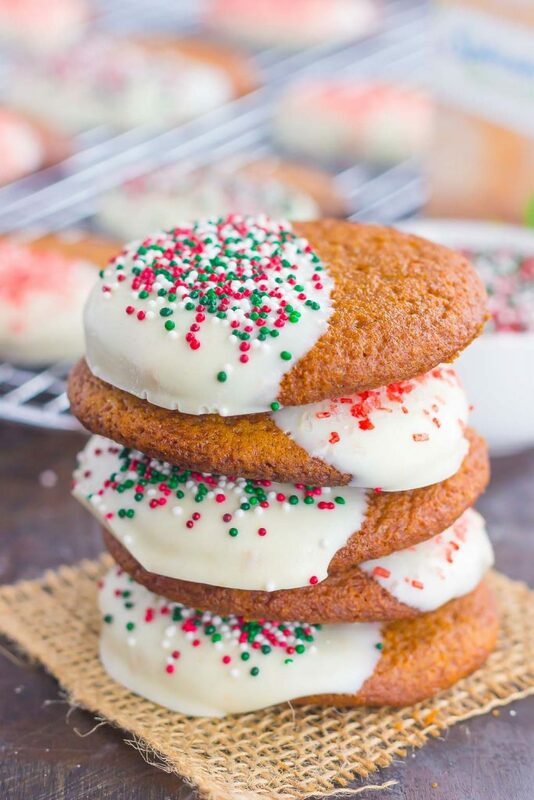 I love the warm spices and those sprinkles just scream Christmas! Happy Holidays! Thanks for the sweet comment, Rachelle! Happy holidays to you, too! They look amazing! I love chewy cookies :) they look so festive! Thanks for the cookie love, Nadia! You're so right...it's so easy to get caught up in the busy-ness of the holidays that unless you make a concerted effort to slow down and pay attention, it might slip by... I find myself doing all the things you describe! That's what it's all about! As are these delectable chewy cookies! Pinned! Yes! It's so hard to slow down during the holidays, so I really need to make a conscious effort to do so. Thanks for the kind words, Annie! I feel the same way and it just feels like we're trying to rush to get things checked off our lists. Cookies are the perfect way to slow down though. I love that gingersnaps remind you of your grandma. 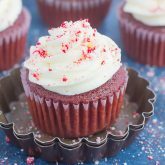 These are SO pretty and festive and using stevia is such a great idea! Thanks, Kelly! I'm trying my hardest not to rush through the holidays, but it's so hard! This time of year needs to sloooooow down, right?! 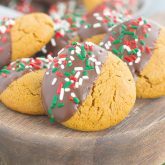 I love these cookies -- so simple, but so perfect for the holiday. Enjoy the next few days, Gayle! Thanks for the cookie love, Blair! Hope you have a great week! I've been trying to savor the moments this season too, and so far so good! It sounds like your enjoying your holiday season Gayle, and these cookies look so delicious and festive! It's nice that you've found a gingersnap recipe to keep your grandmother's tradition alive, and I love that you've dipped them in white chocolate. These flavors sound incredible! I hope you have a great week and Merry Christmas! Thank you, Marcie! I hope you have a wonderful week too and a great holiday! This is definitely a fast paced time of year, these cookies look like the perfect way to stop and savor the moment :) they look absolutely wonderful, and I looove that you dipped them in white chocolate! Oh man, I do love those cheesy Christmas movies! You just can't help but smile through those even if they are incredibly predictable! These cookies are so festive--I'm in love! They totally make me smile too! Cheesy movies are the best! Thanks for the cookie love, Michelle! Christmas is coming so fast this year. I have all my shopping done, but I just can't believe how quickly it's passing by. This combo of gingersnap and white hocolate sounds great. Have a great Christmas! The holidays always go by way too fast...we need a pause button! :) Thanks for the cookie love, Amanda! This is the first year in a long time that I've really tried to enjoy the holiday season and slow down and man, what a difference it makes! I actually feel like I got to experience it, you know? ANYWAY I loveeee gingersnap cookies! These sound so good!! It really does make a different when you try to slow down a bit! Thanks, Ashley! I don't think my morning comment went through :) These cookies look gorgeous Gayle! What a great combination! Can't wait to try them! Thank you, Mira! White chocolate and gingerbread is one of my favorite combos! Well, now I'm TOTALLY craving cookies for breakfast! I'm obsessed with gingersnaps, but dipping them in white chocolate? I'm a goner. These wouldn't even last a day in my house!! These were gone too fast in my house, too. Thanks, Sarah! Thanks for the kind words, friend! Hope you have a wonderful holiday too! These are absolutely gorgeous, Gayle! I can't believe Christmas is on Sunday...I really need to do some shopping!! Happy holidays! Thanks for the kind words, Denise! My husband and I finished wrapping our gifts last night...so a huge stress relief haha! :) Happy holidays to you, too! I can't believe it at all, I don't feel Christmasy in the least bit and I'm pretty sure our Christmas tree is arleady dead lol! Maybe I just need to whip up some Christmas cookies and blast some Christmas music! I love how festive these look! Just wanted to pop by real quick and let you know I took your survey... although I'm sure you know I LOVE your site as it is! I hope you have a wonderful Christmas, Gayle!! Cheers, friend! Aww thank you, Cheyanne! You're so sweet and I really appreciate it! :) Hope you have a wonderful Christmas too! Gayle, wanted to let you know the comments are turned off in your two latest posts. . I was trying to leave a comment for your top 10 recipes.. I didn't know if that was on purpose. . wanted to let you know! Thank you, Alice! I did turn off the comments on purpose to give myself a break over the holidays! :) Thanks for letting me know, though! These look great! What temperature do you bake them at? Hi Kathy! The recipe instructions say 350F...hope this helps!